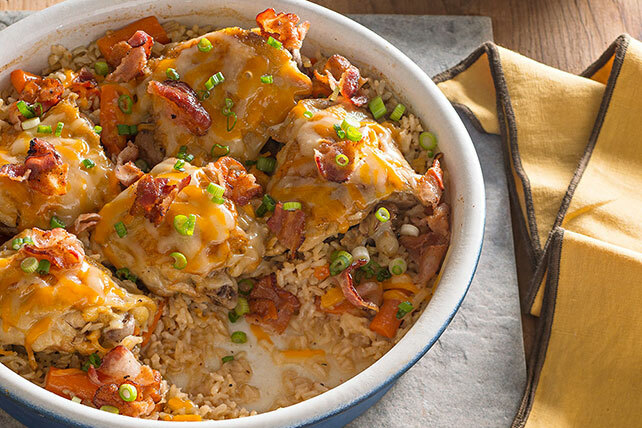 How do you make a chicken-and-rice bake exciting? We did it by using brown rice and chicken thighs for a change. Then we added bacon and melty cheese. Add chicken to reserved drippings; cook 3 min. on each side or until evenly browned. Remove from skillet; set aside. Add carrots and rice to skillet; cook and stir 3 min., adding garlic for the last minute. Stir in broth and dressing; bring to boil. Spoon into 2-qt. casserole sprayed with cooking spray; top with chicken. Cover. Bake 1 hour or until chicken is done (165ºF) and rice is tender. Remove from oven; top with cheese, bacon and onions. Cover; let stand 5 min. or until cheese is melted. Prepare using 6 chicken legs (about 1-1/2 lb.) or 3 bone-in chicken breasts (cut in half after cooking).